It has come a long way in Europe – from the ancient Persian lands in the Middle East or today’s Iran, which is considered his homeland. Probably few know that lilac belongs to the large botanical family of olives and today are known dozens of species of this fragrant flower bush. However, it is important for scientists, but for all people beautiful flower remains just a beautiful symbol of beauty, purity and gentleness. Some believe that he was brought in ancient Greece from the neighboring shores of Asia Minor. The most common modern legend says that the Austrian ambassador in Constantinople Angerius Busberg in 1562 he moved to Vienna as a gift to Emperor Ferdinand I. A year later the beautiful bush appeared in the city castle of Her Majesty Queen Elizabeth and immediately spread in the gardens of the other rulers of European countries. Fragrant flowers quickly started adorns the royal parks in France, Germany , Denmark, Norway, Sweden, Russia. For several decades, however, lilac became chamberlain of conceited in universal favorite of young and old – for a short time he conquered not only the parks and gardens in European cities, but even hospital courtyards. Began to prefer it and landscaping the area around public buildings, schools, care homes, places of recreation. 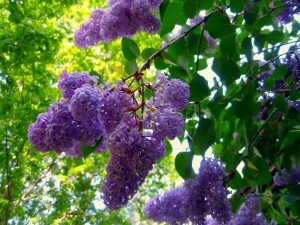 In Germany in May to make small bouquets and wreaths of lilac branches that decorate the doors of their homes. There is also a tradition for children to stringing blooms each other, twisted them and dry them to remember the spring. They very carefully looking happy lilac color that is not four, as in clover, but with five or more petals. It occurs more often among white lilac and purple with – extremely rare. Many sophistication and romance put into affection for the beautiful flower French and the Russians – in these countries believe that fragrant shrub is a symbol of awakening and if lilac dream will soon wake up in love . 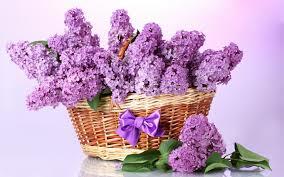 No such feelings , however, share the British lilac – lilac with them , especially the white lilac is a symbol of grief and a harbinger of misfortune. Whatever legends , however , one thing is certain – we all like lilac , not only because it is sleek and beautiful, but also because it smells wonderful. Chemists have shown that the flavor , which senses light and a hint of bitter almonds, due to the level of hydrocyanic – senile acid in very small concentrations. Few people know that this strong poison is contained not only in the colors of lilac , but also in its leaves . And here’s the “secret ” – because of the content of tsianovodordna acid, which is highly volatile , lilac has earned fame and “killer insects ” – in urban ecosystems it is preferred because it emits minimal amounts of it, and it kills flies mosquitoes and moths. So , it turns out , lilac not only brings us joy , but can also be useful.